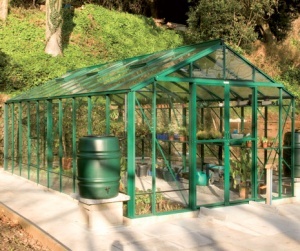 These superb greenhouses have been designed for everyone from the enthusiastic amateur to the professional nursery grower - the Rosette greenhouse offers everything you could need. The additional width (10ft 7in) and a choice of unliminted lengths, allow for greenhouse staging of up to 3ft 1in (940mm) wide on both sides of the greenhouse. The Robinsons Rosette greenhouse can be also be fitted with a fully-glazed partition to provide a segregated propogation area, with a choice of single or double doors.